Do you stock or have any idea where I can buy a set of intoductory cartridges for a HP Photosmart C8180 All-In-One printer? Regards , Gary Ratcliffe. If you're referring to the SETUP cartridges, these are bundled with the printer and are only available from HP. We don't supply SETUP cartridges, the HP Photosmart C8180 ink cartridges that we stock are the regular replacement cartridges which you can use after your printer has finished using the SETUP cartridges that came with the printer. Please contact HP directly if you need SETUP cartridges for your Photosmart C8180 printer. Different 363 colour cartridges contain different quantities of ink. For example, the magenta cartridge may be 7ml and the yellow may be a little more or less. Can you buy larger quantity cartridges for convenience? Unfortunately, you can only buy HP 363 cartridges in one size. There are no high capacity cartridges available for the HP Photosmart C8180 printer. We purchased a C8180 Photosmart printer a couple of years back and are very happy with it. However, our new computer with Windows 7 isn't compatible with the HP printer software disc that came with printer. Are you able to supply me with a disc which is, or offer a solution? Hi, do you stock the starter cartridges for the HP C8180 printer, please? It has to be the ones for initial start up, I think they are different from the normal cartridges. Thanks, Chris. No, I'm afraid we don't stock any starter cartridges. The starter cartridges are not usually available for general sale and are usually bundled with the printer itself. Please contact HP directly to source starter cartridges for the HP Photosmart C8180. How do I enter the set of three colour cartridges into the shopping basket? There is no button to enter them. I require the set of three for a HP Photosmart C8180 printer. I'm sorry to hear that there is no "Add to basket" button available for you to use. I have checked the page you were looking at and I can see the blue "Add to basket" button so I can only assume that there is some sort of connection error. Can I ask you to refresh the page (or press the F5 button) and see if this fixes the problem? If it doesn't correct the problem, may I ask which browser you are using? Is the drop down box for quantities visible on your page? How many ml do the Photosmart C8180 ink refills contain? The compatible HP Photosmart C8180 ink cartridges we sell contain the same amount of ink as the genuine HP ink cartridges. If you click on any item this will then take you to a new web page where you can view a more detailed item description under 'Product Specification'. Please can you tell me if it's possible to get metallic silver ink cartridges for the Photosmart C8180 printer? Unfortunately, we do not sell metallic silver Ink cartridges for the HP Photosmart C8180 printer. Any such items are unlikely to be official HP products and will be manufactured by a third-party if they exist. I'm very interested in saving money by using compatible ink cartridges such as yours, but whenever I try to use one I get a message stating that the cartridge will not work. Is there a way to override this? We're confident that our compatible Photosmart C8180 ink cartridges will work within your HP Photosmart C8180 (Providing it's fully functional and was purchased within the UK). Our compatible HP C8180 ink cartridges are professionally manufactured to the highest standards. We also have a 30 day money back guarantee so you can try any items from Cartridge Save risk free. If you do have any issues with these cartridges then please don't hesitate to contact a member of the customer care team. You can sometimes override error messages by pressing the OK or Cancel button on your printer. The HP Photosmart C8180 all-in-one is a thermal inkjet printer that offers print,copy and scan functionality. This top of the range HP all-in-one device offers a host of advanced features that will impress photo enthusiasts. An automated photo holder, red eye removal button and Lightscribe DVD drive for copying photos to CD or DVD media are all included. Printing is exceptionally quick at up to 34ppm in black and 33ppm in colour using draft mode. The Photosmart C8180 uses a 6-ink system with Vivera inks and the only down side to using this machine could prove to be the cost of the cartridges. However, at Cartridge Save we stock discount HP Vivera inks meaning you don't need to worry about going over budget to get fantastic print quality. Our cheap original HP Photosmart C-8180 ink cartridges offer true HP performance at a low cost. If you want the cheapest inks then our compatible HP Photosmart C 8180 cartridges may be of interest so why not use our easy to navigate website and find yourself a bargain. When you order our HP C8180 ink cartridges you save time and money because every single item comes with free delivery as standard with expected arrival the following day. We realise that at such low prices some shoppers may question the quality of our cartridges. To underline our confidence in the build quality of our cartridges we support every purchase of HP C-8180 inks with our money back guarantee. We understand that occasionally problems arise due to compatibility issues or if you are really unlucky a faulty cartridge. Simply return any cartridge to us in this unlikely scenario and we will be happy to refund your money in full. Pick up your HP ink today and enjoy the many benefits of ordering from Cartridge Save. Aimed at the busy and discerning photographer looking for superior output, the HP Photosmart C8180 is an intelligent photo printer integrated with an efficient copier and a scanner. Though it is packed with other useful features and can print high-quality photos, the printer is not exactly made for printing documents. It is expensive and is still sluggish compared to competing models from other brands. This thermal inkjet printer is among the most expensive multifunctions from HP. Though it lacks a fax machine, the HP Photosmart C8180 does have a 3.5-inch touch-screen LCD display and wireless connectivity options such as Bluetooth and built-in Wi-Fi. The swivelled touch-screen is the printer's centrepiece; it integrates most of the controls for wireless set-up, management, photo editing, and scanning. There are memory card slots for xD, Memory Stick, SD/MMC, and Compact Flash. It is possible to print directly from your memory card or digital camera using PictBridge technology of the HP Photosmart C8180. You can also print wirelessly from a Wi-Fi and Bluetooth-enabled device. The C8180is integrated with the 6-ink HP Vivera cartridge system and boasts a maximum printing resolution of 4800x1200 dpi. The HP Photosmart C8180 also comes with 2 paper feed trays and a built-in drive for LightScribe DVD for direct archiving. The printer is quite heavy at 11.3 kg and bulky at 38.8 cm in diameter, 44.8 cm wide, and 21.6 cm tall. 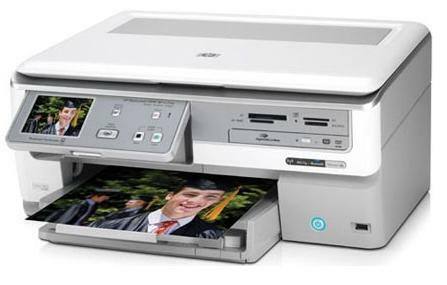 The HP Photosmart C8180 lacks a fax machine and an auto document feeder, which is already standard in other less expensive and faster HP all-in-one printers. Prints on plain paper looks washed-out.